Monday, Ocean Geo-Frontier Co. Ltd (OGF),* which is jointly owned by NYK and others, signed a consignment service agreement with Japan Oil, Gas and Metals National Corporation (JOGMEC) for geophysical surveys to be conducted by a three-dimensional geophysical survey vessel (seismic vessel). In 2018, Japan’s Cabinet Office approved the Third Basic Plan on Ocean Policy for the development of domestic resources in sea areas around Japan, and surveys leading to the discovery of new oil and gas fields are thus expected to be in greater demand. To meet this new demand, NYK teamed with Hitachi Ltd. (Hitachi) and PGS Geophysical AS (PGS) to submit a tender to JOGMEC in February 2018 and establish OGF in December 2018. 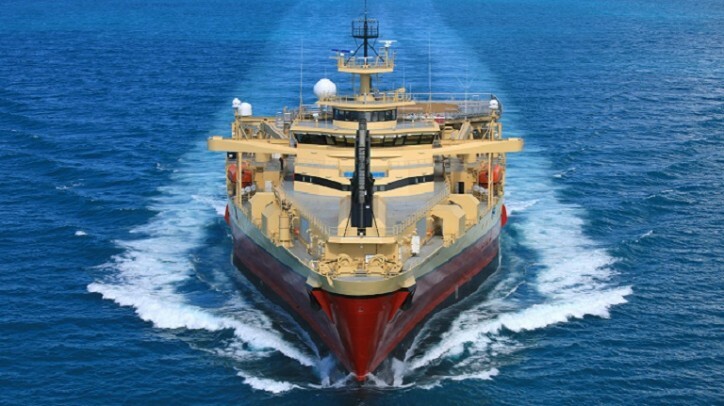 OGF will use JOGMEC’s seismic vessel for a wide range of business activities, including basic geophysical surveys (for domestic petroleum and natural gas), vessel operation and management, geophysical data acquisition, data processing, and the supply of related equipment. This business is based on the Cabinet Office’s Basic Plan on Ocean Policy for Japan, with the aim to acquire detailed geological information in sea areas around Japan for the development of domestic resources. The service agreement will continue for up to 10 years through annual renewals. To detect oil and gas fields a few kilometers below the seafloor, seismic waves are artificially produced through a sound source known as an air gun, and by receiving the seismic reflection from the sea bottom on the over 8 kilometers of streamer-cable and analyzing the acquired data, a detailed picture of the crustal structure below the seafloor may be obtained.